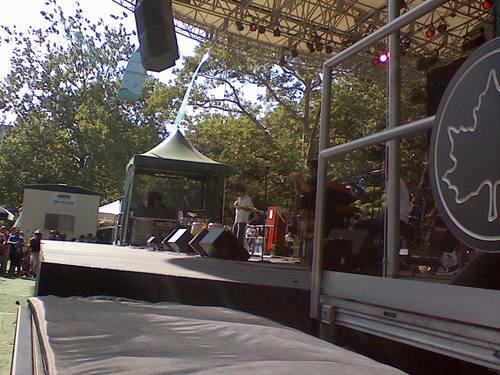 I never heard of cat empire b4 so I came to Summerstage not knowing what to expect. I was hit with a whole bunch of musical influences ranging from salsa and meringue to calypso and soul. They repeated the phrase 'music is the language of soul' and they made the audience understand every note and word effortlessly. At my first look at the name Brazilian Girls, I thought, like anyone else, that there would be a bunch of girls from Brazil. I was way off, but they rocked it with their unique sound of ska/dance music. The lead singer (who was the only girl btw) danced around the stage in her version of a tutu, had energy for days and had the crowd feeling the same way. great shots...i love the cat empire! they are awesome. i have seen them many times and love them! hmm....never heard of cat empire but your review convinced me to check 'em out....thanks angie! I never heard of them either but great review!! I'll chk them out! I think you have a career in photography chick!! never heard of them but nice shots!! !